Elon Musk’s Tesla Motors isn’t just an electric car company–it’s perhaps the greatest test of Silicon Valley’s innovation model. And now is do-or-die time, when everything is riding on a new $50,000 sedan. affordable car, which puts it between steps one and two of Musk’s master plan. By July, the company says it will begin delivering its new Model S sedan, a fully electric vehicle that’s being manufactured at Tesla’s new factory, in Fremont, California. The Model S seats between five and seven passengers; it will start at about half the price of the Roadster–$49,900–placing it in potential competition with a variety of so-called mass luxury cars like BMW’s 5 series and the Audi A7. Another Tesla model, an SUV known as the Model X, was unveiled in early February and will likely hit the market sometime at the beginning of 2014, at prices close to the Model S. Yet further down the road, should Tesla survive and thrive, a prospect that is by no means certain, things get more interesting. Later that year, a third-generation Tesla Motors car will be unveiled. This is step three on the Musk master plan. The vehicle–it’s not yet named–will be an affordable $30,000 car. It truly may be a Tesla for the masses. You might think of Tesla as a company that exists to sell electric cars. Yet after spending time with Musk, you begin to see that Tesla is not really a company that exists to sell electric cars. Rather, Tesla is a company that exists to overturn the entire global automotive infrastructure, an infrastructure that presently functions on petroleum and internal combustion engines but in Musk’s belief will eventually, and inevitably, glide forth on exhaust-free electricity. To Musk, the most significant problem with this transition is that we don’t know how fast it can or will happen. And this leads to other questions. How quickly will Musk be able to scale up his business to have an actual impact on the world? And when will his competitors–some of whom, Toyota and Daimler included, have paid Tesla hundreds of millions of dollars to build motors and battery packs for their own electric cars–get on board in a big way? Tesla represents the most extreme test in modern history of the limits and capabilities of the Silicon Valley model. Another problem is that Tesla Motors is doing something hard. Not hard in the way that working day and night on a new website or a social-media launch is hard. 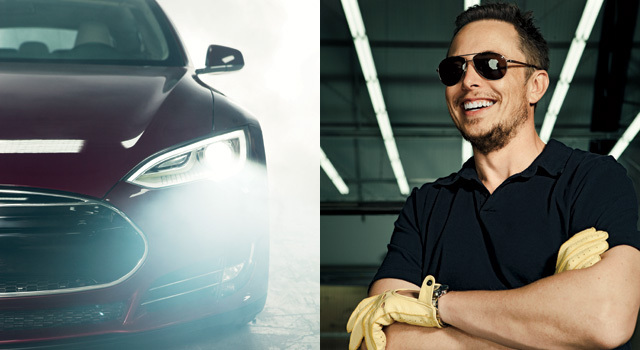 What Tesla Motors is doing is hard in a way that makes your mind ache. The difficulty of the endeavor–making machines that are big, heavy, and incredibly complicated; making machines that require 1,400 employees to design, engineer, and manufacture; making machines that consist of thousands of parts, sourced from all around the world, that must work together flawlessly for years on end; making machines that must be regulated at every step for safety and emissions; making machines that traditionally have slender profit margins; making machines that use a radical new technology with a track record of only a few years; and making machines that in their electric incarnations have never appealed to a large market of buyers–explains why most entrepreneurs would rather start a business moving electrons around the Internet than within a car motor. If launching a major new automobile company is close to nuts–“probably the hardest thing in the world,” as one auto analyst told me recently–then launching a major new electric automobile company is certifiable. You might as well light a bonfire in downtown Palo Alto and burn a billion dollars. Did he know how difficult this would turn out to be from the start, I ask? Was he surprised by how hard it actually was? After a pause, he adds, “When we got Tesla going at the very beginning, if you asked me what I thought the odds of success were, I would have said less than 50%. I would have said that failure is the most likely outcome.” But he would not say that anymore. Straubel and Musk both work out of the second floor of Tesla’s headquarters, in a gymnasium-size room where most of the company’s business is done. Hundreds of staffers, hunched in front of computer monitors, sit crowded together. There are no cubicles; in the company’s quest for efficiency, all the desks are Ikea tables. Musk, who goes to the office two days a week (he lives in L.A. rather than the Valley and spends a significant part of the week at his other big startup, SpaceX), sits to the side of the big room, a few feet away from Straubel, at a polished wood desk. Other than a MacBook Pro, a water bottle, and a mug of coffee, Musk’s desk is clean. “These days, I work probably 85 hours a week, maybe 90,” he tells me. While he’s now at the office part-time, he says he still manages the company 24/7 and that no nuance of engineering and design is beneath his scrutiny. I heard this from a half-dozen others at Tesla too–that Musk’s involvement verges on that of a Jobsian obsessive, which is arguably not a bad thing when your company has to build something that is essentially flawless. 1. 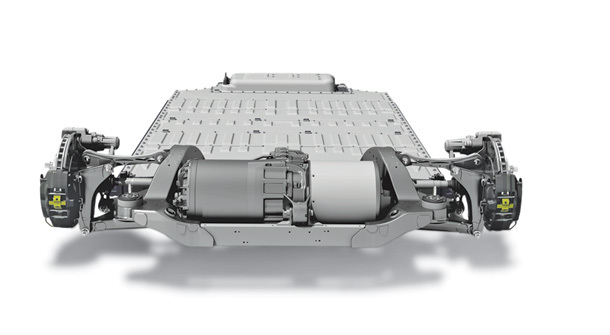 BATTERY Like all electric cars, the Model S’s motor is fueled by a pack of lithium-ion batteries–in this case, a flat pack of them embedded underneath the floor of the car. The lowest-capacity Model S battery powers the car up to 160 miles per charge–at least 60 more than most competitors’. That may increase the battery’s life span, because fewer charging cycles are needed. 2. MOTOR When you press the car’s pedal, you increase electricity flow from the battery to the motor. Unlike a gas-powered internal combustion engine, the Model S’s motor is fairly simple: The electricity creates two magnetic fields, causing a magnetized component to spin around, which creates the mechanical energy that activates the hardware that turns the car’s wheels. 3. SYSTEM While a gas-powered engine system has many moving parts, electric cars have relatively few–no fuel lines, tanks, or exhaust–meaning the car is more efficient in using energy. About 75% of the battery’s energy goes into moving the car; in a gas-powered car, that number is about 20%. 4. BRAKING When you hit the brake in a gas-powered car, momentum and energy is lost as heat. In the Model S, something different happens: The motor becomes a generator, spinning in the opposite direction and turning the excess mechanical energy back into electricity that partially recharges the battery. Downstairs from Musk’s office is Room 24M, a cavernous, high-ceiling garage brightened by hanging fluorescent lights, where the company’s new cars get evaluated. During my January visit, most of the spots here are taken up by what’s known as the Model S “beta” fleet–several dozen early-production, not-for-sale Model S cars, all painted black and all given a number. Each beta is for a different type of testing and data collection–on brakes, suspension, noise and vibration, crashworthiness, and so forth. Tesla is not letting any outsiders drive the vehicle yet, but Ali Javidan, who runs the garage, offers me the shotgun seat in beta car No. 24. “The interior isn’t finished,” he says as we pile in, but everything else is pretty close to operational. There is no way to turn a Model S “on”; you merely need a key fob in your pocket and a sensor allows you to drive once you’re settled in. We head out of the garage and up into the hills, on the winding roads above the Tesla offices. The car is sleek and smooth. And whisper quiet. One of the hallmarks of a well-engineered electric car is its torque–that is, what drives its acceleration. In part this is because electric-vehicle (EV) technology is significantly more efficient than a gas engine. I tell Javidan the car feels fast, and he looks at me quizzically. “I only had the pedal down a quarter of the way,” he says. So he floors it, and my head immediately snaps back, not unpleasantly, against the headrest. To understand why the Model S is innovative as well as risky, a quick gearhead primer is useful. Electric cars are in certain aspects much simpler than gas cars. There are fewer moving parts, and there’s no engine of any kind. Electric cars have a motor, which in the Model S is fairly small–about the size of a watermelon–and is located between the back rear wheels. The motor runs on electricity stored in lithium-ion cells, thousands of small batteries, that in this particular model are arranged in a rectangular “flat pack” compartment that in effect forms the floor of the car. The software of the car is in an essential component too; through something called a drive inverter, it regulates how stored energy in the battery pack is used by the car’s motor. Still, even if a Tesla proves itself as both simpler and more sophisticated than a conventional car, there’s plenty that can go awry. Musk tells me he thinks the Model S has already made it over the most difficult hurdles. But it is hard to say for sure. “What could go wrong?” says Adam Jonas, an auto analyst at Morgan Stanley. “New technology, new factory, new manufacturing techniques, new company, new distribution channels–there are very few things here that aren’t new.” Jonas actually sees a bright future for the company, but he acknowledges that the road ahead will be difficult. And for Tesla, he adds, the bar is set extraordinarily high. To Musk, the conventional thinking about the EV market is one reason why so many people fail to grasp Tesla Motors’ potential. At the moment, fewer than 13 million cars and small trucks are sold in the U.S. each year. About 2% of those are pure electrics or hybrids. The accepted wisdom, Musk argues, is that “there’s a market for electric cars and all electric cars compete against each other for that market. But that’s just the wrong paradigm.” Musk does not believe the Model S or X will compete with other EVs for dominion over a tiny slice of the consumer market. Models S and X will instead compete with gas-burning BMWs and Lexuses. And because Musk is assured his EV technology will prove superior in performance (and emissions), it will thus succeed. environmentalism–than on economics. At the moment, what’s actually driving EV sales is government policy. Car companies, with their sights set on meeting high-mileage and low-emissions requirements for their fleets, view electric and hybrid vehicles as crucial to their vehicle portfolio. At the same time, customer rebates of up to $7,500 from the federal government and up to $2,500 from the state of California bring these cars into the realm of affordability. Yet two other factors shift the equation: The price of gas, though climbing, has remained fairly low over the past year, and the price of lithium-ion batteries is fairly high. By the calculations of Menahem Anderman, arguably the country’s leading lithium-ion battery analyst, gas would have to be about $10 a gallon to recoup the lifetime cost of an EV like the Leaf. Anderman believes the economics look far better for the new plug-in Toyota Prius–$6 gas makes it a sensible economic proposition. In sum, his firm projects that the global EV market in 2015 will be quite modest in size (250,000 in sales) and will be dominated by Japanese and German automakers. Tesla, in his estimation, would be lucky to sell 15,000 cars. This line of sight gives Straubel and Musk faith in their business model. But they’re also buoyed by customer enthusiasm, which may be telling skeptics something the economic models can’t. When I ask Musk if it’s possible that Tesla could fail to sell 20,000 Model S cars annually, he says that it already has more than 8,000 preorders. And Tesla does not advertise, does not give discounts, and has never given any test-drives. Word has spread virally. One afternoon in California, I make a visit to the Tesla factory in Fremont, about 30 minutes northeast of the company’s HQ. For years, the factory was operated jointly by Toyota and GM; it was known as NUMMI (New United Motor Manufacturing Inc.). Tesla bought most of the factory buildings in 2010 for $42 million–the equivalent of pennies on the dollar. With the help of a $465 million federal loan (another example of federal policy nurturing the fledgling EV industry), the company began a strenuous effort to rehabilitate the old space. 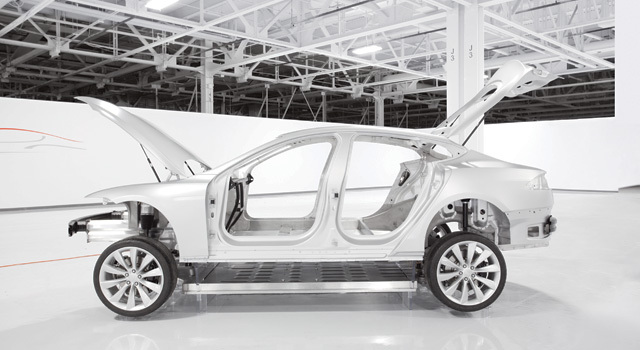 When I visit the plant, the final beta versions of the Model S are making their way through a gleaming new assembly area. When it’s up to speed, the factory should turn out 80 a day. If there are any suspicions that Tesla has more modest ambitions than it lets on, a visit to the 5.5-million-square-foot plant will quickly dispel them. “Elon wants to fill up this factory,” Gilbert Passin, Tesla’s VP of manufacturing, tells me during a tour. Passin, a native of France and a manufacturing wizard who spent his career at Toyota and Volvo, is driving us around in a golf cart. The plant is almost too large to walk through; we go past the production lines, the tool dies and presses, the plastic molding shop, in and out of buildings, and on and on for what seems like miles. “This factory was capable of producing a half-million vehicles by NUMMI,” Passin explains. “We obviously are starting with a modest contribution of 20,000 a year. But we have all this, all these buildings.” By Passin’s estimate, Tesla now takes up about 15% of the factory, most of which remains grimy and locked up. This may explain why there’s a lot of chatter in Silicon Valley about whether Tesla can be the next Apple. Of course, designing a physical product and producing it in a vertically controlled manner doesn’t mean you’re the next Apple. There are nevertheless similarities. Tesla is in the process of building a network of elegant stores in affluent areas (all of them overseen, incidentally, by George Blankenship, an Apple retail veteran). 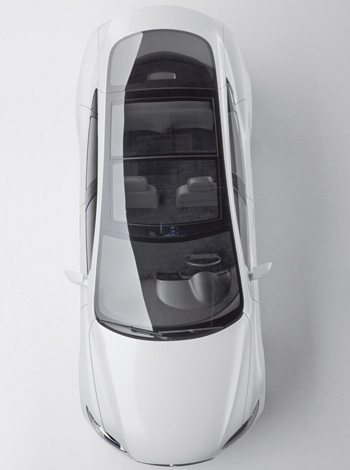 And there seems a conceptual kinship in the way Tesla is trying to bring an innovative, stylish design to market: by starting at a high luxury price point and then moving toward mass production, just as Musk’s master plan said it would. In certain respects this diverges from how other upstart auto companies gained a foothold. Toyota and Honda put down roots in the U.S. market by offering cheap cars with high gas mileage that caught consumers’ interest during the early 1970s gas crisis. Passin starts the cart and we drive the long length of the factory toward the exit. It’s getting late; only a few workers remain. The sun is streaming into the enormous room through the factory’s clerestory windows. It’s bouncing off the floor’s glossy white epoxy and reflecting off the welding robots, more than I can count, all painted a bright and shiny Tesla red. In just a few weeks, production will start in earnest and sparks will be flying everywhere. But for the moment, at least, the factory is immaculate, poised for action, a place of pure possibility. It’s an electric car competing as a luxury sedan. How does it compare in both worlds? **Miles-per-gallon equivalent for Tesla Roadster; Tesla has yet to release MPG for the Model S, but it’s likely similar. Leaf 0-to-60 time from consumer reports. Miev 0-to-60 time from motor trend. No manufacturer stats available.